I met Hendrix De Leon, Sales Manager for JAG Precision, a gentleman and a scholar, who was more than accommodating at allowing me to snap a bunch of photos and show me all their cool new stuff. And let me tell you, this was probably one of my favorite booths of the entire show in terms of sweet new stuff. When I got to the booth, I was immediately scanning for the 240, which, on account of its hulking size, was easy to pick out quickly. 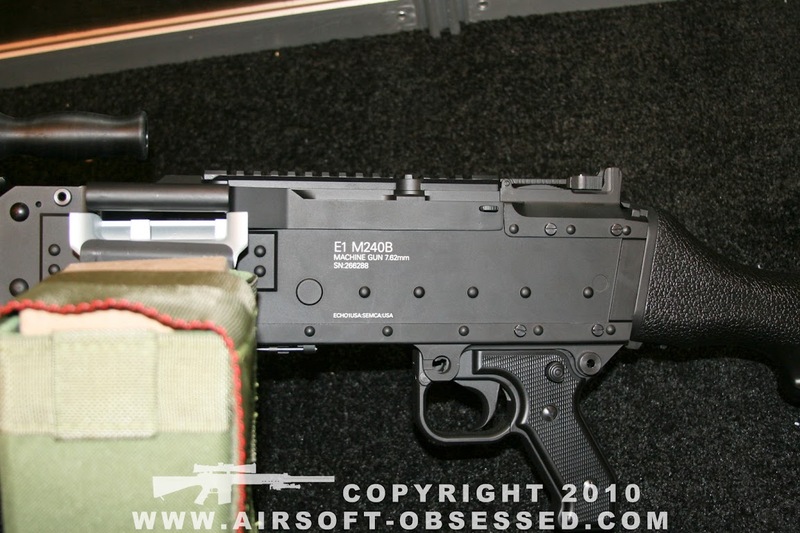 It's an incredibly massive AEG and is not for the weak. 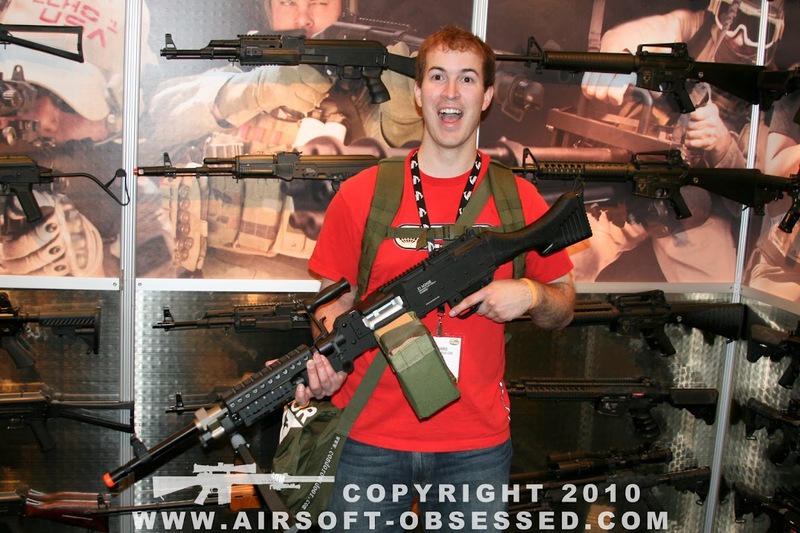 Even at 6'4" tall, my brother (below) still looks a bit small next to this impressive Airsoft support weapon. 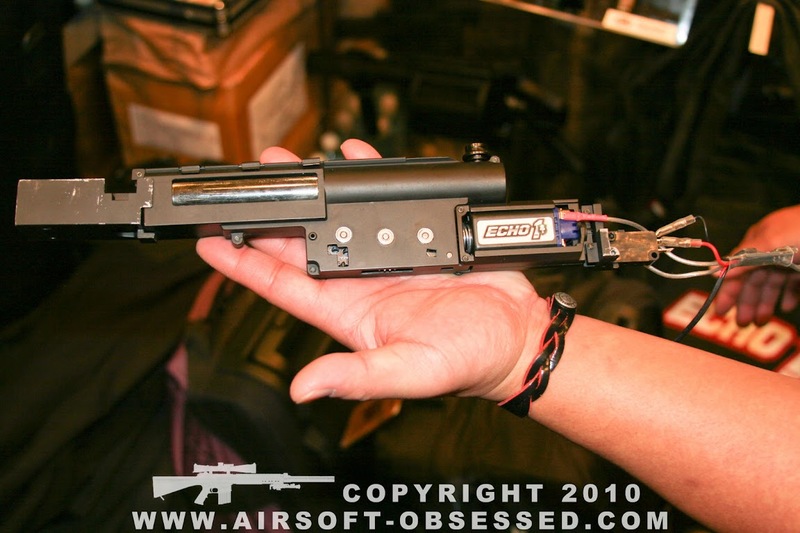 The Echo1 M240 Bravo's gearbox looks pretty sick and includes a MOSFET to protect the trigger contacts & regulate the electrical circuitry. There is no active breaking or anything else too fancy about the MOSFET itself, but it does help the system out by preventing the trigger from burning out. 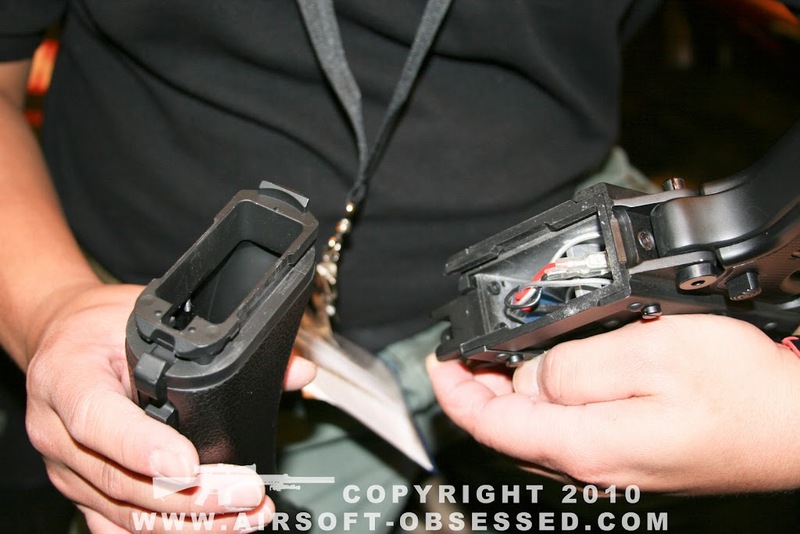 However, even Hendrix admitted that the MOSFET was a bit overkill because of the M249-style trigger unit that the 240 also utilizes. It's very difficult to burn those up as it is. But nonetheless, the MOSFET is a nice touch and quite frankly, I love overkill. The other added benefit with the MOSFET pre-installed is that in the event one DID prefer to have a unit installed with Active-Breaking and any other features like, for example, those that come with my friend Terry's high-end units from Extreme-Fire, you're good to go because Echo1's M240 Bravo is already pre-wired so that you can just swap out the stock unit for the another model extremely easily and without having to open up the gearbox to rewire anything. SWEET!!! The CNC work on the 240 Bravo was pretty impressive and looks like somebody knew what they were doing when it was made. I'm not sure yet about whether one has to remove the outer barrel every time they need to adjust the hop-up dial (above), but when I asked about seeing the hop-up, Hendrix showed me how to quickly remove the solid aluminum outer barrel so that I could get a full view of the entire unit. I forgot to ask if there was a way to adjust the dial without having to take the barrel off. Oh well. I'm not perfect, but one way or the other, the truth will emerge at some point about that. 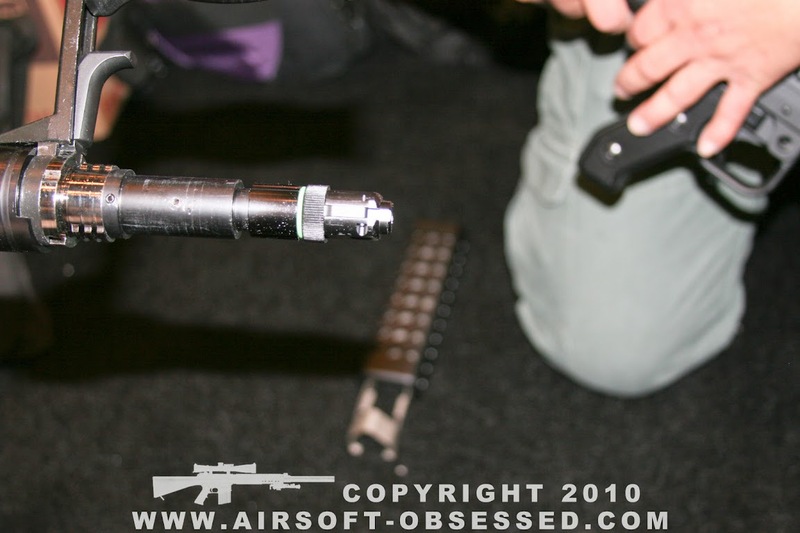 The stock is pretty much a quick-detach ("QD") setup, which makes it nice when you go to plug in your large-capacity, high-voltage battery in for sustained periods of man-sized automatic, suppressing fire. CAN I GET AN "AMEN!"?!?! 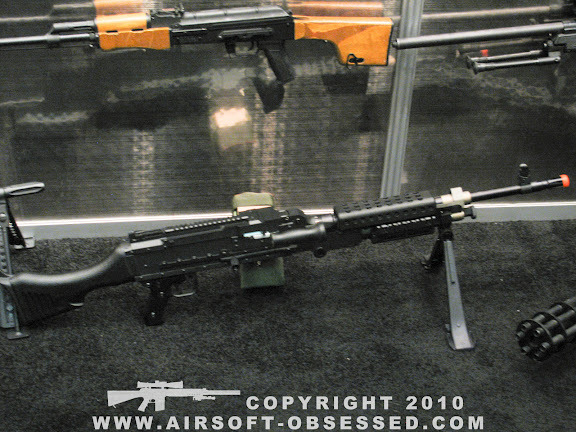 As of Friday, January 14, 2011, the Echo1 M240 Bravo has been released for sale to the public. MSRP is $750 and I want one (Something tells me Todd does, too).